First things first, you need to invite all your friends! Why not make your own Halloween pumpkin stamp to decorate your invitations with? Just carefully cut an apple in half, cover it in orange paint and press it onto some plain card. Voila! 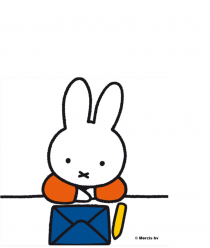 Once it’s dry, you can draw Miffy and a stalk onto the pumpkin and write out the time and date of your party. It’s going to be such fun! Every party needs decorations! Make your own Halloween bunting with paper plates – just paint them orange and, once they’re dry, draw some pretty Miffy pictures on them and hang them up around the room. Remember to keep your apple stamp after making your invitations – you can use it to make a Halloween table cloth. Just stamp it onto a white paper table cloth and let it dry. Perfect! Now for the finishing touch… a glowing Miffy pumpkin, of course! What could be more delicious than Miffy skeleton cookies? Just use your Miffy cutters to create your Miffy shaped cookies, then carefully cut out some black and white marzipan to create the spooky skeleton. A yummy Miffy cake or cupcakes will be the perfect treat for everyone. OoooOoOoOooOoo!